After D-Day in 1944 the number of Germans plotting against Hitler increased. Claus Philipp Maria Schenk Graf von Stauffenberg — a colonel —was the only officer among them and the only one with regular access to Hitler so he agreed to carry out Hitler’s assassination, code-named Operation Valkyrie. It was set for the Fuhrer’s briefing hut at the military high command in Rastenburg, East Prussia, called the Wolf’s Lair. Stauffenberg put two small bombs —each weighing about 1 kg (21b) — in his briefcase. Each was equipped with a simple, soundless, chemical timer that could be set to explode after either a ten or 15 minute delay. When he arrived at 10.15am on 20 July, Stauffenberg discovered that Hitler’s headquarters had been moved from the underground Fuhrerbunker to the Lagebaracke, a hut made from wood, fibreglass and plaster with a reinforced concrete roof. Stauffenberg told Hitler’s butler that he needed to use the bathroom and took his briefcase with him. He locked the door, opened his briefcase and began to prime the bombs. It was difficult because of the injuries he had suffered the previous year. He had lost his left eye, his right hand, and the fourth and fifth fingers of his left hand during a British strafing raid. 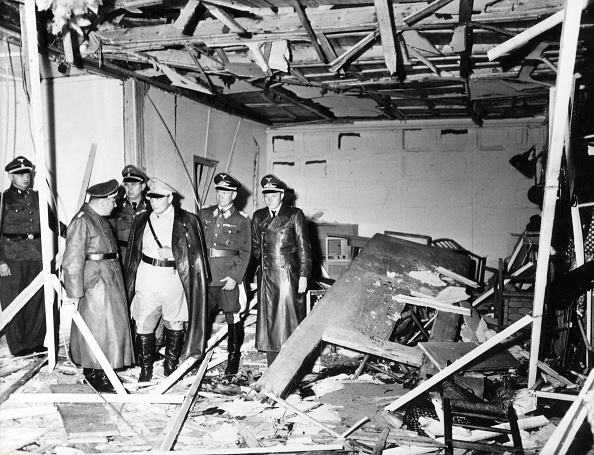 Stauffenberg had only managed to prime one bomb before he was called back into the room. He handed the other, unprimed bomb to his aide de camp. He put his case under the conference table not far from Hitler. The meeting went ahead 30 minutes earlier than planned at 12.30pm, because Mussolini was due to arrive at 3pm. After a few minutes, Stauffenberg excused himself saying that he had to make an urgent telephone call to Berlin. He waited in a nearby shelter for the explosion. The bomb went off at precisely 12.42pm and the hut was virtually destroyed. Hitler’s stenographer, Heinrich Berger, was killed and every one of the other 23 men present injured. Hitler was saved because the heavy, solid oak conference table deflected the blast. Hitler suffered concussion, singed hair, cuts to his forehead, a bruised back, burned right calf and left hand and hurt eardrums but the main injury was to his dignity — the blast had ruined his new trousers. More than a thousand conspirators were condemned in show trials and executed.